Pressing your own vegetable oils is a sustainable way to ensure you have this recommended pantry staple for long-term use. Sunflower seeds are often overlooked in terms of supplies for sustainable living, yet they are one one of the most versatile types of seeds to have on hand. Not only are they beneficial to the garden, but can be used for alternative power, has medicinal properties, can be fed to livestock, and can be pressed into fresh oil to use for cooking. Imagine all the space you could save in your pantries just by pressing your own oil. When I’m searching for long-term products, I’m looking for items that will serve multiple purposes, are well built and easy to use. The following video shows how simple it is to press oil from the Piteba manual oil press. What I like about this type of oil press is that different nuts and seed can be pressed in making oils. In fact, according to Piteba’s website, it can process up to 11 pounds of seeds per hour or 5 pounds for smaller sized or lightweight seeds. They even have a seed calculator on the website so you can find out how much of your desired seed you will need for pressing. In addition the oil pressed from your Piteba can also be used in making homemade soaps and even nut milks and butters. This is a great product to have for long-term off-the-grid events. The black oil sunflower seed is the preferred seed for making sunflower oil. When making oil, keep in mind that you will need a lot of seeds to make enough oil for long-term use. In fact, one website estimated that it would take forty pounds of sunflower seeds to make at least 2 gallons of oil. Many homesteaders designate an area in their garden for growing sunflowers. They will prepare the beds, scatter the seeds around, and water the beds. When the flower heads go to seed, you can collect the head and store them in a plastic bucket until they dry out. This might take up to a week. Once dried, the seeds should easily come off when shaken. Sunflower seeds last two to three months in raw form. 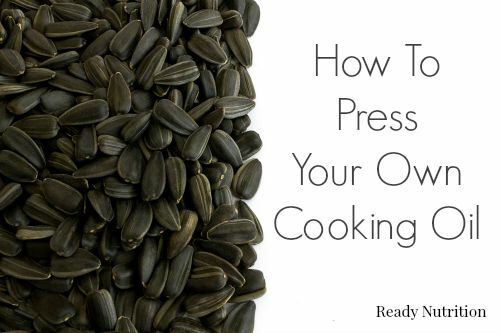 When these seeds are pressed into oil, the oil will have a similar two year shelf life to other vegetable oils like peanut oil and vegetable oil. Sunflower oil can go bad over time. Read more about what signs to look for with rancid oils. As we are all trying to find ways to live more sustainably, the understated sunflower seed should be a long-term consideration for your pantry plans.